For those that didn’t catch our President on the David Letterman show last night, I was pleased to see that the 44th President of the United States appreciates the value of a heart. Mary Apple was the woman (who will find my Website one day) who found the heart spud. She had apparently visited the Letterman show two years ago and brought her prize possession. Cold-hearted Letterman, however, didn’t realize her value. So who said finding hearts everywhere would get you nowhere. For Mary Apple, it got her one degree separation to the leader of the free world. It might also get her into the Smithsonian. No biggy. I found your article on the Heart Shaped Potato that was given to President Obama when I googled my mom's name to find more articles to send her about her potato. I'll make sure to send her a link to your site. Claire sent me a link to your website. I found you! Now that didn't take long did it? Nice to see a heart shaped potato. It is really true that love is everywhere. 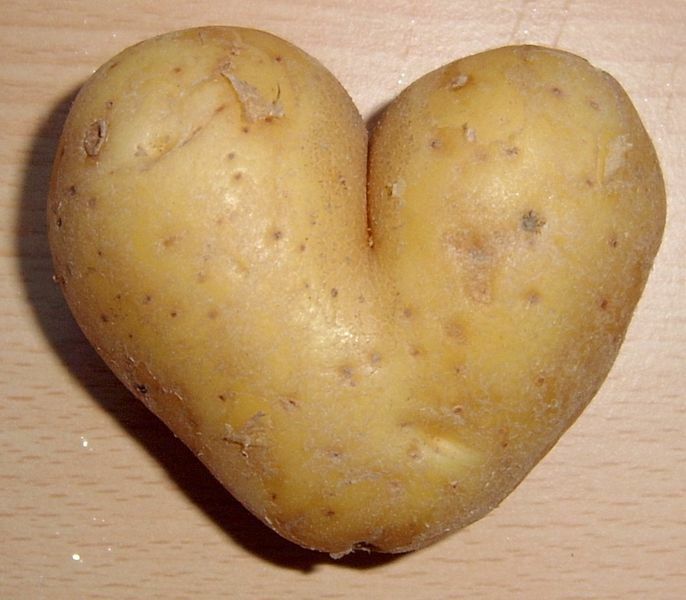 As you can see, even the potato has a heart.